GEO VISION (2015-2017) - D.M.A.T. GEO VISION is a Horizon 2020 project designed aim of developing software that enhances interactive visual communication as a supportive tool for critical field workers. The focus will be on the safe and efficient forwarding of mission-relevant content such as images and videos from the affected areas, to coordinate emergency personnel in the best possible way and to save more lives. Duration: 01.01.2015 – 31.12.2016, Extension until 02.2017. Development and testing of innovative, mission-critical software (ASIGN), support and improve the rescue operations and spare additional resources. ASIGN Allows faster transfer of visual content from disaster areas, whether from satellites, drones, or ground forces, to the operations center. The software processes the recorded data before sending without compressing to save time and preserve the quality of the recordings. Another achievement of GEO VISION is the expansion of the use of smartphones. Thus, in addition to the reception of messages about other alarms in the field of application and application-relevant photos and videos can be obtained. Current changes are forwarded via a live portal via satellite directly to the end users. The following video explains GEOVISION – Mission critical visual communication technologies and presents the different applications for emergencies: https://www.youtube.com/watch? On January 15, 2016 the first Audit Meeting of the GEO_VISION Project took place in Oslo Norwegen. The project partners agreed that the newly developed solutions for the mission-critical multimedia communication are on the right track and it will become a valuable support to the Emergency Service. The RADIO Software developed during the Project is a complete software system that combines the advantages of different sub­-system. The main Components of this complete Solution are ASIGN, ASMIRA and AIR with the GIS Components that associated with UNOSAT Live Card. On 23 November 2016, the results of the Horizon 2020 project GEO-VISION were presented in Lieboch, in Styria. The project partners ANUSR Technologies, Johanniter and D.M.A.T. Consulting KG addressed the critical and interested listeners of civil defense organizations from Austria, Germany and Italy. At the demonstration, the viewers were shown various solutions for mission-critical, visual communication. In addition to the presentation of the exploration application, there was a test flight with a drone, the transmission of recorded video and a live web map. The displayed software solution was not only tested over common communication networks. The entire project team attaches great importance to the use of the developed products via satellite links, as this is intended to guarantee the optimal transmission of relevant data in operations. D.M.A.T. Consulting KG would like to thank all participants in the final demonstration and all partners for the successful presentation of the jointly developed and tested solutions. 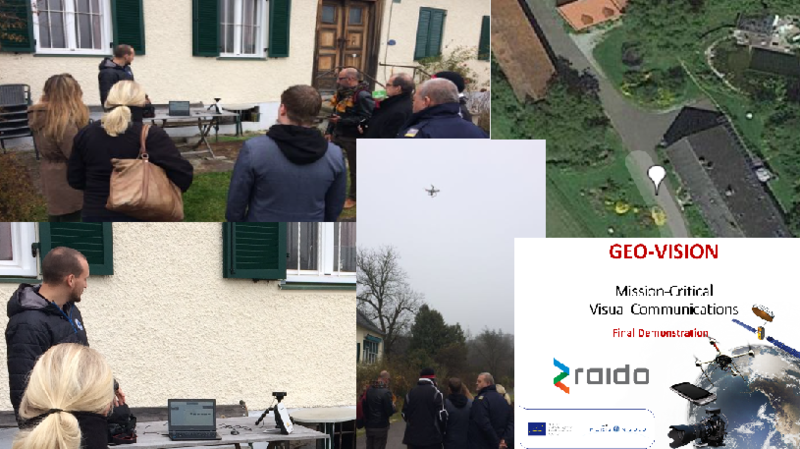 At the end of 2016, the Horizon 2020 project GEOVISION had an exciting final exercise in Lieboch, Austria. The main objective of the project was the development of software which guarantees that mission-specific, visual information will reach the emergency services in case of deployment. GEO-VISION is a helpful application for forwarding information about the current situation in crisis areas as quickly as possible to the field operations centers. In the event of a catastrophe, GEO-VISION is an important source of information, primarily for the emergency services, but also for the public. 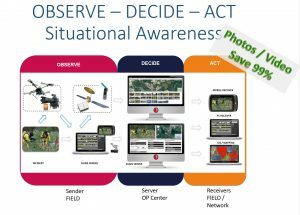 The usual sequence of forces to investigate the current situation: observation flight, evaluation of the situation, coordinated assistance. Below picture is, the observation flight which is already supported by the GEO-VISION application. on the field. Observe, collect data, weigh situation and act. 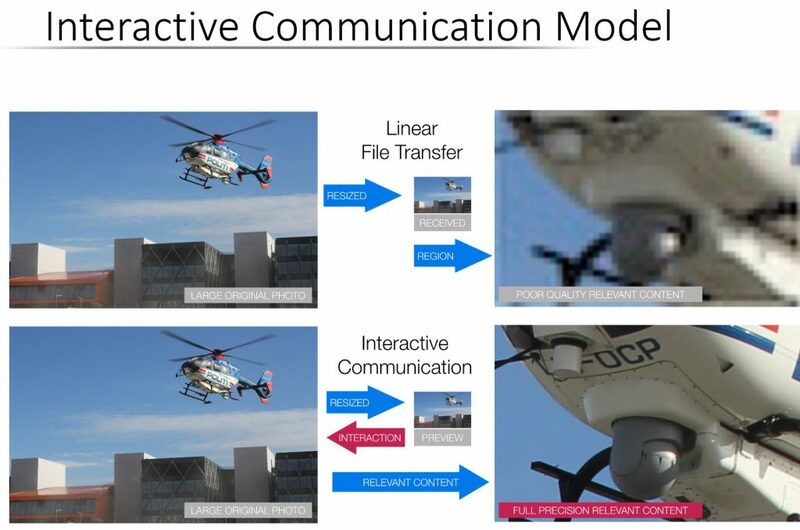 Improving the quality of output of captured images and data by using the integrative communication systems developed in the GEO-VISION project. The following figure compares the previous linear data transfer with the developed integrative method. More information about the GEO-VISION project can be found on the below links. Click on the following links to open a new window. 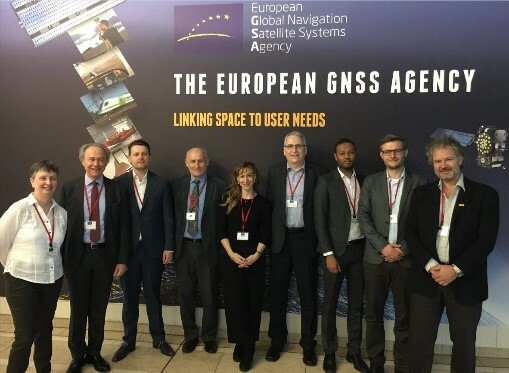 The last meeting of our Horizon 2020 project GEO-VISION, “GNSS driven EO and Verifiable Image and Sensor Integration for mission-critical Operational Networks”, took place at the GSA, European Global Navigation and Satellite System Agency, Prague. Two challenging years have ended with an interesting result about Crises relief Operations. Software ASIGN has been further developed in the project to be the fastest exploration tool I (Prof. Dr Hirschmugl) have ever seen. ASIGN is easy to use and mainly self-explicatory. The change of information between the exploration staff and the Homebase in the field or the base of Operation is easy and quick. The transfer of the data works well over conventional network connections as well as using satellite connections such as BGAN – INMARSAT.